After a year in which the European Union slipped back into recession, more than two-thirds of the public are dissatisfied with the direction of their country in seven of the eight nations surveyed. The most dissatisfied are the Greeks (97%), the Italians (96%) and the Spanish (94%). Only in Germany is more than half the population content with its country’s direction. Given the overall level of dissatisfaction across Europe, there is little difference in attitudes among demographic groups on their country’s direction, with some exceptions. Young German adults, those aged 18 to 29, and Germans with a college degree are more likely to be satisfied than people 50 years of age and older or the less educated. The same holds true for young people and the better educated in France, the Czech Republic and Britain. The debilitating effect on the public psyche of the prolonged euro crisis is evident in the erosion of satisfaction in some but not all countries. Since 2007, before the euro crisis began, national contentment is down 46 percentage points in Spain, 13 points in Italy and 7 points in the Czech Republic. But in Germany (+24 points) and Poland (+7), people are feeling better about the state of their nation. 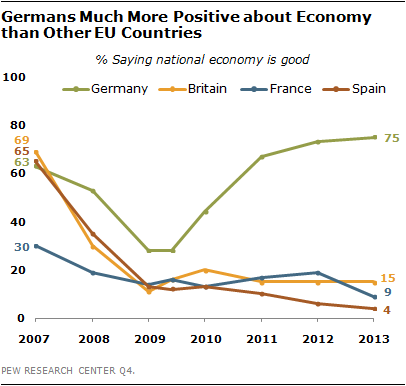 National ennui reflects profound negativity about the economy everywhere but Germany. Positive economic assessments are down 61 points in Spain and 54 points in Britain since 2007 and are now in single digits in four of the eight European Union nations surveyed. Just 1% of the Greeks, 3% of the Italians, 4% of the Spanish and 9% of the French describe the current economic situation in their country as good. Opinion in Britain (15%) and the Czech Republic (20%) is not much better. And there is a clear north-south divide in the degree of economic pessimism. An overwhelming 79% of the Spanish, 72% of the Greeks and 58% of the Italians say their economy is performing very badly. Only 3% of the Germans are that downbeat. Such extremely bleak assessments of the economy have risen a bit in France (9 percentage points) and Spain (7 points) in the past year. But the really notable changes have come since 2007. Since then, the proportion of the public who thinks their national economic situation is very bad is up 74 points in Spain, 44 points in Italy, 31 points in Britain and 21 points in France. Only in Germany, where the economy grew a modest 0.7% in 2012, yet faster than the overall European Union average of -0.3%, does most (75%) of the population think the economy is doing well. This represents a significant improvement over sentiment in 2009, when only 28% saw economic conditions in a good light, despite the fact that the German economy was growing at 3.3% at the time. Given overwhelming public negativity about the economy, it is not surprising that there is little difference in attitudes among demographic groups within societies. However, older people in Britain and the Czech Republic, those 50 years of age and older, are more worried about the economy than the young. Germans and Czechs without a college education are significantly less satisfied than those who have graduated from college. And women in Germany and Poland are more downbeat than men about the economy. Such economic despair may have reached its nadir, however. Sentiment cannot get much worse in Spain, Italy and Greece and has very little further to fall in France. Notably, economic concern has not changed much in Britain or Poland over the past three years. European publics are generally only slightly more upbeat about their nation’s economic prospects over the next 12 months than they are about the current state of their economy. Just 11% of the French and 14% of the Greeks expect the economic situation in their country to improve. Optimism about the future of the economy is largely unchanged compared with sentiment held last year, although it has declined 11 points in France and 10 points in Britain. A majority of the Greeks (64%) and the French (61%) and a plurality of the Italians (48%) and Spanish (47%) actually expect things to get worse. About half of Poles (51%), Germans (49%) and Czechs (47%) and four-in-ten British (40%) see economic conditions remaining the same over the next year. But in the Czech Republic and Britain, no change means continued economic stagnation. The Czech economy contracted by -1.3% in 2012 and Britain’s grew by an anemic 0.3%. 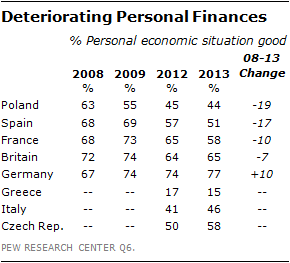 As in past Pew Research surveys, most Europeans are much more satisfied with their personal finances than they are with their national economy. At least half of the people in five of the eight countries surveyed characterize their personal finances as good, including roughly three-quarters (77%) of the Germans. Only in Greece does an overwhelming portion of the public (85%) think their own finances are bad. The college educated are significantly happier with their economic situation than are those who do not have a university degree in seven of the eight countries surveyed: by 24 percentage points in the Czech Republic and 23 points in France. But in most societies there is no statistically significant difference in attitudes between the attitudes of the young and the old or between men and women. Nevertheless, even this relatively positive indicator has eroded as the euro crisis has persisted. People’s assessments of their personal economic situation are down 19 points in Poland, 17 points in Spain and 10 points in France since 2008. However, they are up 10 points in Germany. Europeans are generally not that much more optimistic about the future of their personal finances than they are about the future of their national economy. Majorities or pluralities in every country but Greece and France think their personal economic situation will remain unchanged over the coming year. Moreover, people are deeply pessimistic about the economic prospects for the next generation. Nine-in-ten (90%) in France and nearly three-quarters in Britain (74%) and Italy (73%) think that when today’s children grow up they will be worse off financially than their parents. The plight of the next generation is a particular concern among people 50 years of age and older in Germany, Britain and Spain. The perception that there is a large gap between the rich and the poor in their society drives this pessimism. In all nations surveyed, those who see inequality as a very big problem are more likely to think that today’s children face a bleak economic future. Economic bad times both reflect underlying troubles afflicting national economies and heighten public concern about those issues. At the heart of the euro crisis has been spreads in borrowing rates for different countries, bank failures, and losses by bond holders and depositors. Such financial sector uncertainty is seen as a major threat in all the European countries surveyed, particularly in those that have experienced or fear banking problems. Fully 95% of the Greeks, 75% of the Italians and 70% of the Spanish say international financial instability is a major threat to their country. Roughly two-thirds of the French (66%) agree. 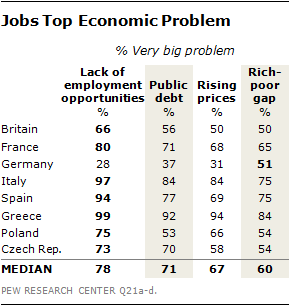 Inflation, unemployment, inequality and debt are also widely shared concerns throughout Europe, except in Germany. Among the eight European Union nations surveyed, a median of 78% of the publics cite a lack of employment opportunities as a very big problem. Fully 71% are strongly concerned about public debt, 67% about rising prices and 60% about the gap between the rich and the poor. The intensity of worry varies widely among countries depending on the topic, with Germans’ relative lack of concern about any of these challenges the most notable. This German exceptionalism has policy implications as European governments sort out how best to deal with the problems cascading from the euro crisis. The economic downturn has exacted a heavy toll on employment across Europe. In March 2013 the jobless rate hit a record 10.9% in the 27-member European Union. The rate was 26.7% in Spain and 11.5% in Italy, but only 5.4% in Germany. Youth unemployment – those people aged 25 and under – was even higher, at 55.9% in Spain and 59.1% in Greece (January 2013 figures). In seven of the eight nations surveyed, joblessness is most often cited as a country’s premier economic challenge. At least nine-in-ten Greeks (99%), Italians (97%) and Spanish (94%) think a lack of jobs is a very big problem in their country. Their intensity of concern is shared by eight-in-ten French (80%). It is noteworthy, however, that in Germany, where the jobless rate was only 5.4%, just 28% complain that unemployment is a very big problem. Public debt plagues a number of European economies. Indebtedness as a portion of the domestic economy is 159% in Greece, 127% in Italy and 90% in France, according to 2012 estimates by the International Monetary Fund. And this debt-to-GDP ratio is unlikely to change soon. The IMF predicts that in 2018, it will still be 123% in Italy and 88% in France. Most Europeans view public debt as a very big problem, especially in Greece (92%), Italy (84%) and Spain (77%). However, seven-in-ten Czechs (70%) are extremely worried about public indebtedness, even though of the countries surveyed, the Czech Republic carries the lowest debt burden. And Germany’s debt is roughly comparable to that of Spain’s, yet only 37% of Germans are deeply troubled by their public liability. People without a college education are debt hawks in most countries surveyed. Women more than men are intensely worried about public finances in Britain, Spain and the Czech Republic. Notably, however, there is no across-the-board ideological split on public debt. In Britain and France, people on the right are the most concerned. 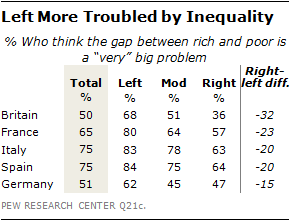 But in other countries, people all along the political spectrum share roughly the same worries. As the International Monetary Fund noted in its Spring 2013 World Economic Outlook, inflation is the dog that hasn’t barked in the wake of the Great Recession. Despite unprecedented monetary easing through various conventional and unconventional measures by both the European Central Bank and the Bank of England, prices in the European Union are falling. In the 12 months ending in March 2013, the annual EU inflation rate was 1.7%, down from 2.7% a year earlier. Prices were rising by only 1.8% in Germany and 1.1% in France. Nevertheless, majorities in six of the eight countries surveyed think rising prices are a very big problem. The Greeks are the most worried, with 94% saying inflation is a major issue. But official statistics show that in March, Greek prices were actually falling at an annual rate of -0.2%. The Italians are the second most concerned (84%) and with more reason. Annual inflation in Italy was running at 1.8% at the time of the survey. Despite a national narrative that the German psyche has been permanently scarred by the hyperinflation of the 1920s, rendering modern Germans inflation-phobic, only 31% of Germans think rising prices are a very big problem. It is notable, however, that less educated people are worried about inflation more than better educated people in five of the eight nations surveyed. And in seven of the countries, women are more worried than men about rising prices. One consequence of the euro crisis has been concern about income inequality in many parts of Europe. Inequality can be measured in various ways. One gauge is how much more of national income is earned by the top fifth of the population compared with that controlled by the bottom fifth. In most nations, that ratio did not increase between 2010 and 2011, the last year for which data is available. But, in 2010 the top 20% of Italian earners commanded 5.2 times as much of Italy’s national income as did people living in the bottom 20% of the income distribution. By 2011 that ratio had risen to 5.6. Similarly, in Greece the income inequality ratio grew from 5.6 to 6.0. As the rich have gotten richer, people across Europe have noticed, and they do not like it. They think that the economic system favors the wealthy, that the gap between the rich and the poor has increased and that the rich-poor gap is a very big problem. But they do not necessarily see it as a priority for government action. A strong majority (median of 77%) of Europeans surveyed think that the current economic system generally favors the wealthy. This includes an overwhelming 95% of the Greeks, 89% of the Spanish and 86% of the Italians. Even seven-in-ten Germans (72%) say the system is rigged. As might be expected, such sentiments are more likely to be held by people on the left of the political spectrum and low-income people than by those on the right and those who are relatively well off. But even then, conservatives and higher income people agree that the system is stacked in favor of the rich. Moreover, the vast majority of all Europeans (a median of 85%) surveyed overwhelmingly agree that the gap between the rich and the poor has increased in the past five years. This is an almost universally shared sentiment, with nearly nine-in-ten Spanish (90%), Germans (88%), Italians (88%) and Greeks (88%) agreeing. Eurostat data confirm Spanish and German fears: Inequality in those nations rose between 2006 and 2011. And half or more people in all eight EU countries surveyed think the gap between the rich and the poor is a very big problem. This is a particular concern in Greece (84%), Spain (75%) and Italy (75%). Political ideology helps drive sentiment on this issue. People on the left of the political spectrum are generally more likely to see inequality as a very big problem than are people on the right, with left-right differences of 32 percentage points in Britain, 23 points in France and 20 points in Italy and Spain. People of all ages are worried about this issue, but there is a generation gap in France and the Czech Republic, with those 50 years of age and older more worried than those age 18 to 29. In France, women (72%) are much more concerned about inequality than men (57%). Notably, inequality is, by far, the Germans’ greatest economic concern among the issues tested, with 51% saying it is a very big problem. Since before the economic crisis, income inequality in Germany has declined somewhat, from 4.9 in 2007 to 4.5 in 2011. But in Germany the top 20% of the population has 12.8 times as much wealth – such as real estate and financial assets – as the bottom 20% of the population, according to a recent analysis of European Central Bank data by economists Paul De Grauwe and Yuemei Ji. Judged by this criterion, Germany has the most unequal distribution of wealth in Europe among the nations studied. Twenty-three years after reunification, the east and west Germans see eye-to-eye on many issues. 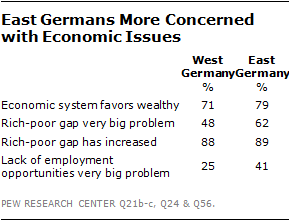 But 79% of Germans in the east say the economic system is unfair, compared with 71% of those in the west. 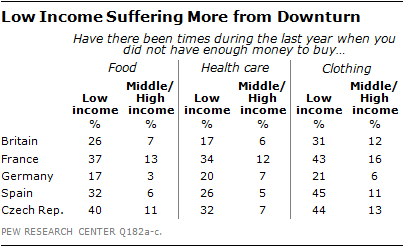 Fully 62% of easterners but only 48% of westerners believe the gap between the rich and the poor is a very big problem. This may be due to the fact that 41% of those in the east think joblessness is also a very big issue, compared with only 25% in the west. Personal deprivation is yet another consequence of the euro crisis, but not as much as might be expected given the recent economic downturn and rise in unemployment. This may, in part, be due to the strong social safety net in most European countries, combined with cultures of extended families in some societies. Since 2007, the proportion of people who say that there have been times during the past year when they did not have enough money to buy food has more than doubled among the British (6% to 15%) and more than tripled among the French (from 6% to 20%). Nearly one person in four in Greece (24%) now reports difficulty paying for food. In Italy, Spain, Poland and Germany there has not been a significant increase in personal deprivation. The share of the population that says there have been times during the past year when they did not have enough money to buy clothing for their family has nearly doubled in Britain (from 10% to 19%) and France (from 12% to 23%) since the recession began. And fully 45% of Greeks say affording needed clothing is an issue. As might be expected, given their relatively good economic performance, the Germans are the least likely to complain about an inability to pay for food or clothing. Despite government-supported health care services across Europe, the proportion of people saying that there have been times during the past year when they did not have enough money to pay for medical care for their family has more than doubled in the Czech Republic (from 7% to 17%) and nearly quadrupled in France (from 5% to 19%) since 2007. In Greece, 36% lament their inability to pay for needed health services. Deprivation hits hardest at the poorest and the least educated, who are often one and the same, even in Germany, where the portion of the population that is doing without is the smallest. Large minorities of low-income Spanish (45%), Czechs (44%) and French (43%) report problems affording clothing. In addition, 40% of low-income Czechs, 37% of low-income French and 32% of low-income Spanish say they have had trouble affording food. And low educational attainment is strongly associated with deprivation. Those without a college degree are often two, three or four times as likely as those with a college education to say they have had trouble finding the money for food, clothing or medical care. Recent economic troubles have clearly made life worse in much of Europe. But in those countries that have experienced good economic performance over time, the benefits are clear. In Poland, where the economy has averaged 4.3% annual growth over the last decade, the portion of the population worried about putting dinner on the table has fallen from 35% in 2002 to 16% in 2013. And the portion that cannot afford health care in Poland has also halved, from 42% to 21%. The euro crisis has created a laundry list of economic concerns, but Europeans generally agree on which challenge they want their government to tackle first: jobs, jobs, jobs. In seven of eight nations, publics prefer that their governments act first on unemployment. About two-thirds of the Spanish (72%), the Italians (64%) and the Czechs (64%) say the most important issue to address is the lack of employment opportunities. Roughly half of the Greeks (52%) and the French (51%) and nearly half of the British (46%) agree. Public debt intensely concerns more than half the population in seven of the eight countries surveyed. But those same people do not see it as a governmental priority. About one-in-five in Britain (22%), Germany (21%) and France (20%) wants their government to first cut the debt. Only 9% of Italians say debt reduction should be the priority, despite the fact that Italy’s debt is 127% of GDP. 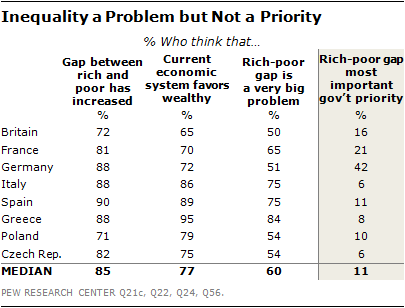 Despite the public’s profound concern about inequality, in most countries it is a lesser priority for governmental action. Only in Germany does a plurality (42%) believe that the gap between the rich and the poor is the economic problem the government should address first. For all the angst in financial circles about the possibility of asset bubbles and inflation as the result of loose monetary policy, European publics place a low priority on governmental initiatives to curb inflation. 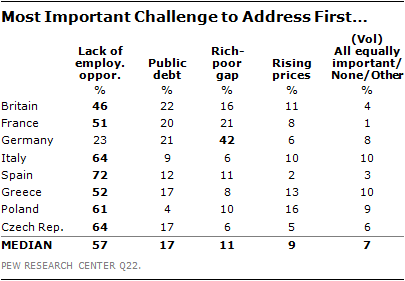 A median of only 9% think rising prices is the first issue their governments should address. In the past year, an ever more visible and vocal public policy debate has emerged in Europe over the right course of action to pull the European Union out of its double-dip recession. Fiscal conservatives advocate even greater efforts to rein in spending to reduce government indebtedness. Others argue that budgetary rectitude will have to wait, that more spending is needed now to jump-start economies stuck in neutral. While policy makers and pundits debate, European publics have already made up their minds. When faced with the stark choice of reducing government debt or pump priming, most Europeans clearly prefer belt-tightening as the means of climbing out of their economic hole. People’s intense worry about jobs and their strong desire to see government take action to increase employment does not translate into support for more government spending to stimulate the economy. A median of just 29% across Europe want to see increased public outlays as a means of solving their country’s economic problems. 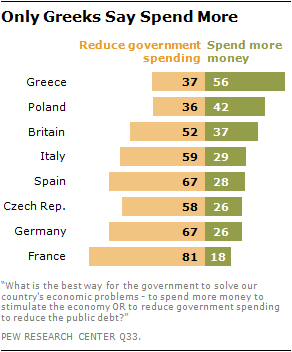 Only in Greece (56%) does a majority advocate more spending. In France, which in 2012 elected a socialist government, just 18% back a Keynesian solution to their woes. About half or more of the population in six of the eight European countries surveyed says that the best way to solve their economic problems is for government to cut public spending to reduce the public debt. Cutting government debt has particularly strong backing in France (81%), followed by Germany (67%) and Spain (67%), despite the fact that these three countries have had significantly different experiences with belt tightening. The French and Germans have yet to experience major austerity. In 2012, government expenditures still grew by 1.4% in France and Germany, compared with a decline of 3.7% in Spain. Notably, it is older people, those age 50 and above, who prefer action on the debt in France. But it is younger people, those aged 18 to 29, in Poland and the Czech Republic who are deficit hawks. And it is people without a college education in Britain, France, Germany and Spain who are more concerned about public debt than their better educated peers.